On August 12th 2017, I summited Mount Whitney Via the East Buttress. It was the most ambitious climb I have ever attempted. It was also the most beautiful, rewarding, and awe inspiring climb I’ve ever accomplished. For the uninitiated, Mount Whitney at 14,508ft is the tallest mountain in the contiguous United States. The East Buttress is a technical climb consisting of 11 pitches. The whole thing clocks in at a cool alpine 5.7 grade III. As far as technical climbs go, 5.7 is not considered difficult, but 11 pitches with a long approach at elevation makes this challenge a test of endurance. This is the first commitment level grade 3 climb I ever attempted. The climb started 6 months ago when me and my 7 friends went online to try to score every reserveable permit they had available for a three day timeslot the first week of august. Miraculously, one of us succeeded on the second attempt. The trip was on. And for 6 months I planned trips to prepare for the challenge that laid ahead. I attempted to (unsuccessfully) summit the technical 5.5 face of lone pine peak. I planned other expedition type climbs where a backpacking trip was combined with a climbing trip. I packed my bags to exceed 50lbs and went on 5 mile hikes. I also fit in as much multipitch as I could so I could be tuned into my partners style and ease the transitions. I didn’t get my base fitness as high as I wanted before the trip, but by the time it was time to drive to the Sierras, I was undisputedly ready. I headed up to the Sierras a day early to pick up our permits from the Mount Whitney Visitors Center so we wouldn’t have to double back into town the morning of the hike. I carpooled with Robin (my climbing partner) and Long. We drove for 5 hours, picked up our permits, and were dismayed to find that the mountaineers route was covered in snow. It was written on multiple pages in cramped handwriting at the rangers station as well as visible with the naked eye. I was hoping all season that the snow would melt so we wouldn’t have to bring equipment to deal with the snow during the climb. I was equipped with an ice axe and microspikes, but that much snow would require crampons. Faced with reality, we stopped at the climbing store Elevations in town to buy some last minute things and get fitted for Crampons. 2 hours later, outfitted with new gear, we drove to Cottonwood campgrounds to camp at 10,000ft for the first night of acclimatization. We had a fire, and met up with the last 2 of our party, Brian and Joyce. Brian climbed the East Face the year before and originally planned on climbing the Buttress this trip but his partner was unable to make it. He came anyway for the views and emotional support, and to summit via the mountaineers route. Joyce was Long’s climbing partner. Our three tents huddled spike to spike in the packed sand small square allotted by the cottonwood campground. I went to sleep that night feeling the affects of elevation right off. I woke up in the middle of the night with my heart racing. That morning we packed our things and headed off to whitney portal. We had to buy a few small things (headlamp batteries) from the portal store and said hello to Doug Junior. We weighed our packs. I carried my backpacking equipment, two sleeping bags, a shared tent and our cams. Mine was the lightest at 47lbs. Robin carried the rope and the remaining climbing gear as well as a one of the two shared bear cans for the 5 of us. His pack came in the heaviest at 65lbs. Both of us carried 33% body weight per our meticulously rehearsed planning. Brian, Joyce, and Long also weighed in around 50-55lbs. The mountaineers route was a doozy. It was a steep as San Jacinto, 5 miles long, had streams to get your socks wet in and mossy ramps to scramble up. There were steep ledges to fall off of. There was snow to slip down a rope lengths into a valley. We didn’t come out entirely unscathed. Long slipped and fell on a rock during a stream crossing and bruised the side of his foot. I asked him to take off his shoe so I could inspect it, and observed that it was painful to the touch and a large purple bruise was forming. I couldn’t tell if he also came out with a stress fracture but he limped when he walked and went much slower from that point forward. Joyce and Brian sympathized with him and took some of his gear from his pack. Joyce as his climbing partner took the lions share of it, beasting it at 50% body weight. I hesitated to go over 50 lbs but I was put to shame by Joyce who pumped up the mountaineers route with more than her fair share and being the smallest person of the group(but definitely not the smallest personality) by at least 20 pounds. Robin also fell down, broke a carbon hiking pole, and met a sharp rock with his thigh. Desperately not wanting to epic and make that minor tumble a thing, I did not volunteer to take any of his weight. Robin hiked along and we didn’t bring it up again. We took a rest day to help stave off altitude sickness and to mentally prepare for climb day. It turned out to be a fabulous decision because we took our ice axes and crampons and did self arrest practice to make sure we were comfortable. I managed to shank myself in the left thigh using my right crampon, but I figured it was for the best to get those pratt falls out of the way in training territory. We set our clock at 4am and woke up. Robin boiled water while I brushed my teeth and washed my face with ice water from iceburg lake. We ate breakfast and had coffee in silence. We noticed a big group of guided climbers approaching the wall and we terminated our 15 minute breakfast and started walking to the base of the climb in the clothes we woke up in. The approach from our tent to the base of the climb was mostly 2nd class but steep in places, but didn’t feel so scary considering we were groping for the trail before sunrise with headlamps. We carried a 9 lb alpine rack on a sling as well as a single backpack between the two of us with two sets of ice axes, crampons, snacks, and 3 liters of water. We clipped our heavy backpacking boots to our harnass haul loops. I volunteered to carry 1 emergency liter of water on my haul loop as well. Our strategy was to alternate leads, with me going first. We finished the approach and roped up around 6:30am. I led the first pitch but accidentally got us off route. It wasn’t too detrimental but I forced Robin to lead a pitch of 5.8 to get us back on route. The only other detraction from this error was an uncomfortable hanging below formed by two narrow cracks and a piton before a 5.8 roof I shamefully couldn’t pull with 110 feet of rope drag. The second pitch brought us to the top of the second tower. We did a short 10ft downclimb back into the second tower notch to put us back on route. We had a choice on the third pitch. We could either do 5.7 with poor pro better climbing or a 5.6 ramp crack variation with better protection. I also like to play it safe so I chose to lead the 5.6 route. I actually found this pitch to be quite fun and stuck mostly in the crack to avoid the ramp. It was like a slopey fist traverse that was easy to protect with the BD 3. We stopped the fourth pitch short at the red corner when Robin chose to build an anchor because of rope drag. I paid him back similarly by stopping the 5th pitch short for the same. It was class 4 easy class 5 at this section and the rope drag was nothing to sneeze at. Our 6 pitch went up pass the right of the Pee wee and turned out to be the money pitch. The exposure and views from this section were superb. I led an amazing 7th pitch stemming the dihedral made by the peewee and the wall and up past a very short and satisfying chimney. I had to stretch the 60m rope to its full length to fit the short chimney on this pitch. Robin led the 8th pitch and made it quite short. He pulled a clumsy roof to end it (whereas I just stepped around the roof), and I started noticing that he wasn’t taking the easiest route every time when he led. Its funny to think about, because he would later say that I would not take the easiest route when he followed. I think the heavy backpack carried by the follower made following extra spicy on this trip. We climbed three more pitches after that but they were all 4th and easy fifth that we could have unroped for. Robin promised his mother that he would be careful so he insisted we stayed roped. At that point I was quite tired of belaying and felt agrivated by that decision. With that much surface feature there were also too many corners to turn that would muffle belayer communication. I tried to communicate with rope tugs but rope tug is hard to communicate with when there is a lot of drag. The end result was a twitching numb left bicep so bad I thought I might have had an altitude induced stroke. We were back at our tents at 6:30pm, completely exhausted and satisfied. 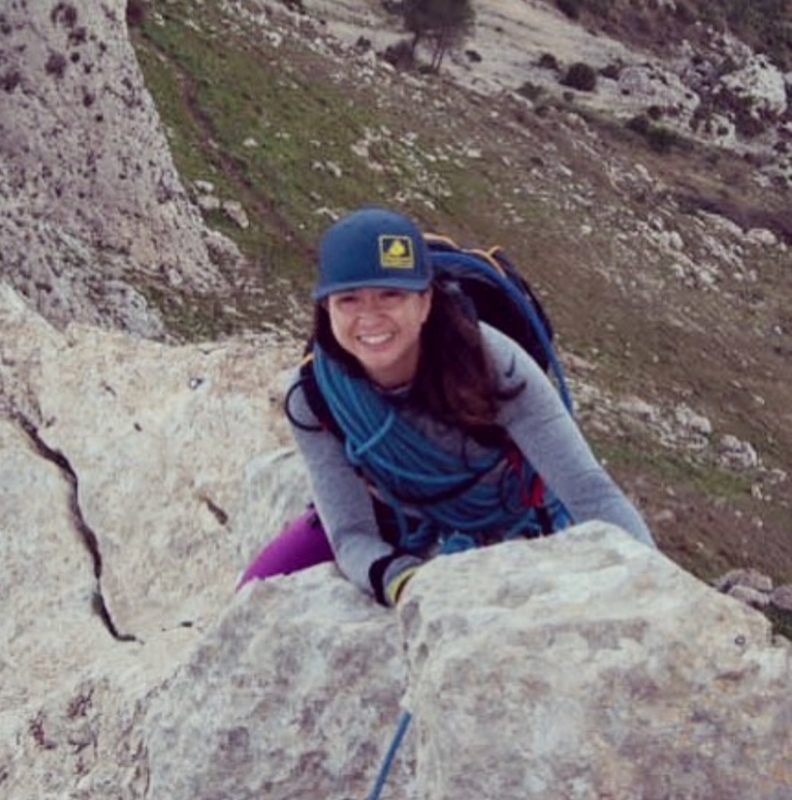 Climbing Mount Whitney was one of the most satisfying events of my life. The views were beautiful, and the climb was challenging logistically but not difficult. The anticipation and training made this so rewarding. It was especially satisfying knowing that by the time we roped up, we were 100% ready for the challenge.